If you're looking to have a fabulous meal with an even better view while frolicking around Washington D.C., head down to Washington Harbor and check out Sequoia! Sequoia is the perfect spot to sit down, relax, enjoy a great meal after spending the day walking around Georgetown. It is only a few blocks away from the main drag of Georgetown, located on K Street. When you go there make sure to get a seat as close to the window as you can so you get a view of the Potomac River. 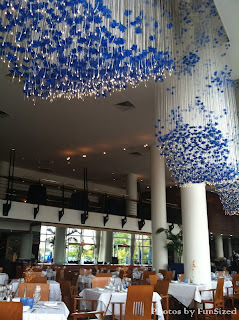 The decor in the restaurant makes you feel as if you are floating at the bottom of the ocean. Just look at this lighting! How fun, flirty and carefree! Now before I tell you about what I ate, let me forwarn you by saying this is definitely a meal you need to plan to splurge on. If you are looking to have one pricey meal on your trip, Sequoia is the place to go to. I went there for lunch but it will be just as good if you go for dinner. I had their Maryland Jumbo Lump Crab Cake and it was delicious! It was only one crab cake but it was paired with spinach and a veggie salsa and it was the perfect proportion! Usually I would think one crab cake would not be enough to satisfy me for a meal but this one proved itself to be jumbo. Even though I probably could have gone without having dessert, I couldn't resist! Everything on the dessert menu sounded delicious. I shared two dishes which are photographed below. 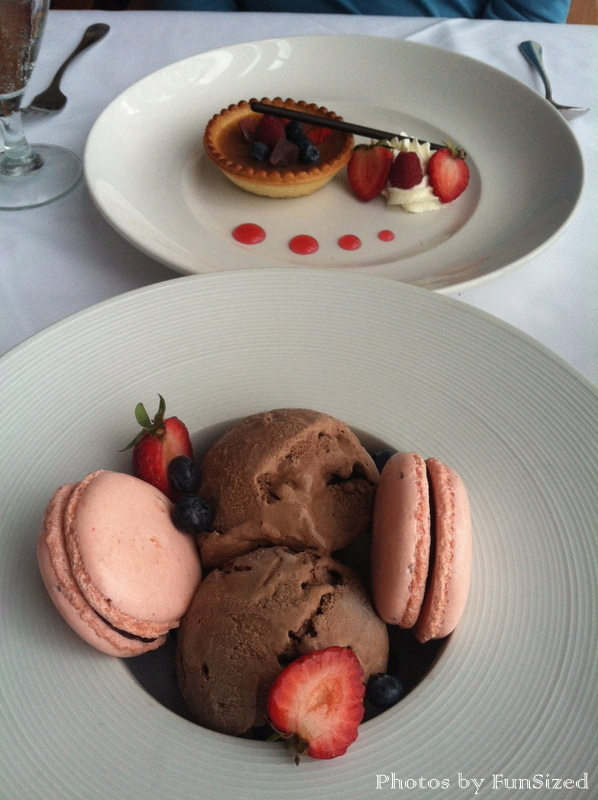 I ordered the chocolate gelato with two rasberry macarons and the other dish is their tarte au citron. They were both to die for! Start saving now so when you visit Washington D.C. you can make sure that you can indulge at Sequoia as well! ALL RIGHTS RESERVED & ALL PERSONAL IMAGES ARE OWNED BY FUNSIZED PRODUCTIONS 2013 ©. Simple theme. Powered by Blogger.